WCLT - Nature Notes 5/9/2008 - Wildflower, weed, or invader? Almost any colorful blossoms can cheer us at this time of year, including the bright yellow flowers of celandine that we see along roadsides, at woodland edges, and among garden weeds. Is celandine (Chelidonium majus) a wildflower or a weed? It all depends on your perspective. Wildflowers are plants that grow and bloom on their own without help from humans. Weeds are plants that grow where you don’t want them. Celandine is a coarse plant, with large, deeply divided leaves, and it often grows two feet tall. If you don’t want it in your yard, it’s a weed. But if you can enjoy its yellow flowers year when little else is blooming, you can appreciate it as a wildflower. You can spot celandine during much of the year. It’s a biennial – a plant that lives for two years. Its leaves are some of the first vibrant green ones that we see in April, and they’re often still green in December, sometimes even under the snow. It blooms from early May into September. Some of us welcome it as a wildflower in the spring, pull it up during the summer, and marvel at its persistence when Thanksgiving comes. We like to think of the wildflowers that we notice in Westborough as native plants, but celandine is not one of them. Instead, it’s a non-native plant that has made itself at home here. In other words, it has become “naturalized” in the wild – like one-third of the wild plants in Massachusetts today. Like many other non-native plants, celandine came to this continent with the early European colonists. It arrived in Massachusetts even before Westborough was incorporated in 1717 as the state’s hundredth town, and the plant has been growing on its own in our landscape ever since. The colonists who brought it here had good reasons to do so at the time. Celandine is native to Europe and Asia, and it had been important as a medicine for 2,000 years, going back to the ancient Greeks and Romans. Colonists also used celandine as a yellow dye. If you tear a leaf or break a stem, you’ll see a bright yellow sap that oozes out. It can stain your skin, so you can see why people once used it as a dye. The yellow sap was also used on corns, ringworm, and eczema. People also used celandine for jaundice and other liver problems because the yellow color of the sap suggested these uses, according to the old-time “doctrine of signatures.” This belief held that a plant’s appearance offered clues to ways of using it. 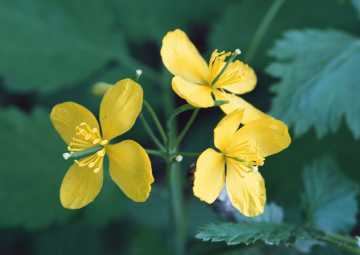 Celandine also served as a treatment for inflammations, hemorrhoids, and lung ailments. Leaves were wrapped on wounds. Celandine was a folk remedy for cancer in China and Russia, and modern research has found that it contains substances with anti-tumor activity. Celandine is a member of the poppy family (Papaveraceae) – a fact that may help to explain the many past medicinal uses for plant. It’s not a source of opium, which comes from the opium poppy (Papaver somniferum), but like other members of the poppy family, it contains several chemicals that affect human and animal bodies. What good are these chemicals for the plant? Most likely they help it to survive, especially in early spring when green things are scarce, by protecting it from animals that might want to eat it. The effects of these chemicals aren’t necessarily good for animals. For example, some evidence suggests that chemicals in celandine have paralyzing effects on mice and rabbits – not good for creatures that need to run away from predators. So is this naturalized non-native plant also invasive? Is it an “alien invader” or “exotic invasive” like purple loosestrife, garlic mustard, oriental bittersweet, Asian honeysuckles, multiflora rose, and Norway maples? The answer may depend on what state you live in. Here in Massachusetts, celandine is not officially listed as an invasive plant. It’s not included in the Guide to Invasive Plants in Massachusetts, a free booklet available from MassWildlife. Note that the Guide lists an invasive plant with a similar name – lesser celandine (Ranunculus ficaria), also called fig buttercup or pilewort, which is a member of a different family, the buttercup family (Ranunculaceae). On the other hand, four states list celandine as invasive, including nearby Connecticut and Vermont, as well as Maryland and Wisconsin. You can also find celandine in the Invasive Plant Atlas of New England (IPANE), an on-line database of plants judged invasive or “potentially invasive” in New England. How likely is celandine to become invasive in Massachusetts? It’s hard to predict. Part of what makes plants invasive is an ability to spread easily to distant locations. For example, Asian honeysuckles, multiflora rose, and oriental bittersweet spread far and wide when birds eat their ripe fruit and then leave droppings containing seeds in other places. Purple loosestrife produces vast numbers of seeds, and some get carried away in rivers and streams. Norway maples produce lots of winged seeds that are blown about by the wind. What about celandine’s seeds? They’re transported by local travelers – ants. Like windflowers and many violets, celandine’s seeds bear tasty bumps that ants like to nibble, so the ants carry the seeds to their nearby underground nests. Celandine can also spread by sprouting new stems and roots from the edges of leaves that get knocked down into the dirt. That’s a neat trick for growing new plants, but not one that moves new plants to faraway places. We may be safe from a celandine invasion, at least for now.